The applications for AJEE the common entrance test conducted by AISECT Group of Universities are now open. Candidates who wish to apply for the different courses can fill and submit the application form by May 25, 2018. The participating universities of AJEE include Dr. CV Raman University (Chattisgarh, Bilaspur), Tagore University, AISECT University and Dr. CV Raman University (Bihar, Vaishali). 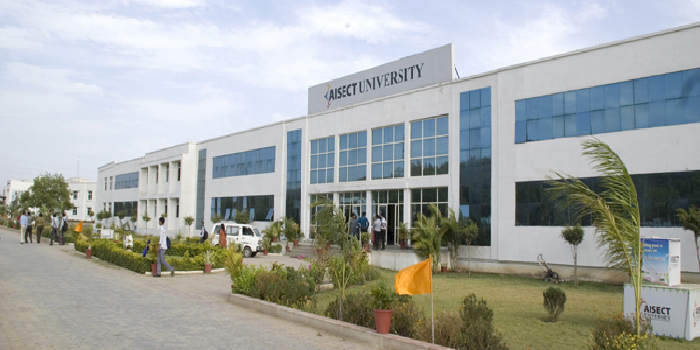 AISECT Joint Entrance Exam (AJEE) is conducted annually by AISECT University. Passed 10+2 level (minimum 45%) in Science stream with Physics, Chemistry and Math from any recognized board i.e CBSE / ISC / State Board or the equivalent. Passed the undergraduate level in any discipline from a recognized university. The course is a 1 year course. Passed 10+2 level in any stream with Mathematics as a subject in +2 from any recognized board in the country i.e. CBSE / ISC / State Board or the equivalent. Passed the undergraduate with minimum 50% level in any discipline from a recognized university. Passed 10+2 level from any recognized board i.e CBSE / ISC / State Board or the equivalent. Biology must have been studied at the +2 level. Passed 10+2 level in any stream from any recognized board i.e. CBSE / ISC / State Board or the equivalent. Selection process consists either of an entrance examination – AJEE 2018 AISECT JOINT ENTRANCE EXAM, which is conducted annually by the University itself, or on the basis of academic merit. The entrance examination is conducted for all engineering courses, all law courses and all education courses. All other courses (B.Sc., B.A., B.Com, B.B.A., B.C.A., B.Lib.) are granted admission on the basis of academic merit. An interview may be conducted for certain courses at the discretion of the University. Your AISECT University, Hazaribagh brochure has been successfully mailed to your registered email id .